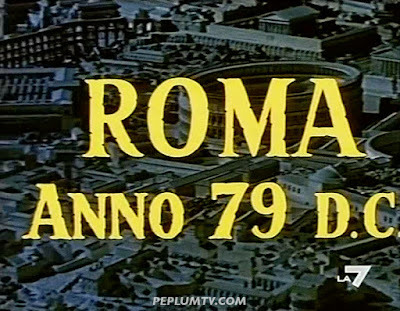 I recently got the Italian version of CHALLENGE OF THE GLADIATORS and I was surprised, and not surprised, by how many scenes were cut from the English versions. I wasn't surprised because I always felt the film was missing something and the Italian copy showed how much it was missing. The film stars Peter Lupus as Spartacus. Of all of the Lupus PEPLUM films, this is my favourite. I'll be comparing 3 versions : The original Italian vs the Sinister Cinema version and the version shown on Canadian TV. I'll mainly compare the Italian and Canadian versions since the Sinister Cinema one closely resembles the Canadian version aside from the opening and closing credits, and one other scene. 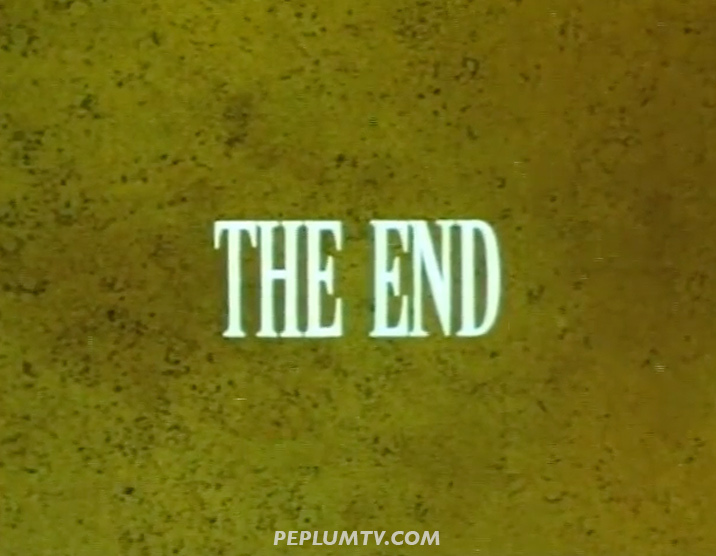 The opening credit is a pretty much standard on seen in many PEPLUM films. It's a full credit. After the credit, we see text explaining the gist of the story. This is not in the Canadian or Sinister Cinema copies. 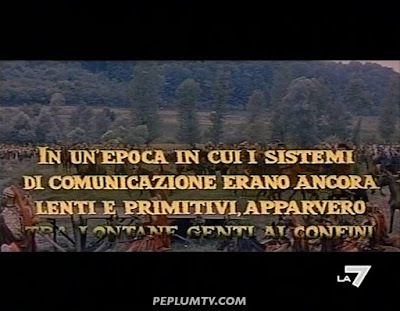 As you can see the opening credits in the Canadian version differs from the Italian version. After the abbreviated opening credit, a narrator explains the gist of the story. The opening credit of the Sinister Cinema version differs from the other two versions. That's the only real big difference. Peter Lupus, as Spartacus, plays tug-o-war with his rebels. This scene is not in the Canadian version but it's in the Sinister Cinema copy. Above and below : Spartacus saved the life of Consul Metello (Piero Lulli) and is let go along with other rebels. This scene is important since we don't know what happens after they leave the Roman camp. A Roman caravan with some women or slaves. This scene is in the Canadian and Sinister cinema versions but it's abbreviated and it's missing the ladies. Above and below : The fake Nero (Walter Barnes) fights with a bunch of gladiators. Great scene. This big scene is entirely cut from the English versions. Why was it cut? Above and below : Lorris Loddi plays a kid who happens to meet with an advancing Roman caravan. He's given a medal by Massimo Serato who doesn't know the kid is actually on the look out for Romans. In the last shot, the kid goes to a rebel to warn them of the incoming caravan, with the medal as proof. Lorris was a popular kid actor in those days. He also acted in CLEOPATRA (1963). He's not credited at IMDb for this film. The rebels wait to attack the Roman caravan. Lupus has a discussion with a rebel. This scene is cut. After the rebels were ambushed by the Roman caravan, Lupus goes to the rescue of a woman in need of help (Gloria Milland). In the Canadian version, once he rescues her, that's it. But in the Italian version, Spartacus brings her to meet the rebels. After Gloria Milland is kidnapped, we see Lupus talking to rebels. This scene is not in the Canadian copy. In the Canadian version, it ends with the standard THE END but it's followed by a full credit, which is nice to see. 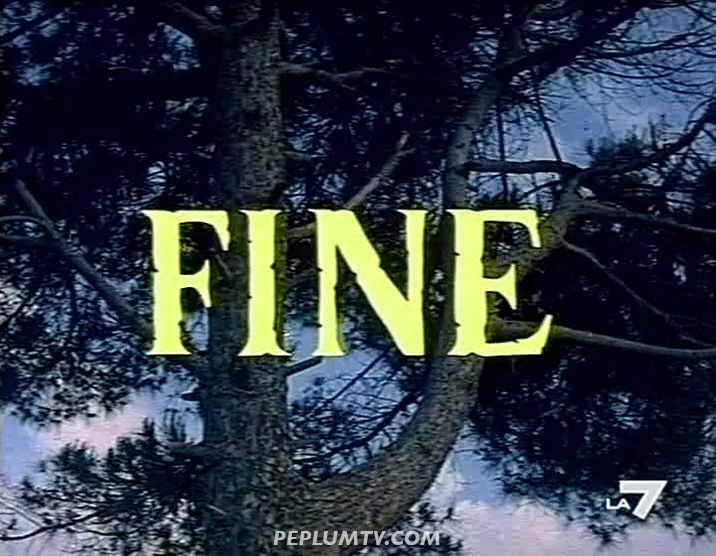 This inter-title is from the Italian version. It's missing from the Canadian and Sinister Cinema copies. In this scene, Massimo Serato holds the statue up in the air. This scene is actually abbreviated in the Italian version. Comparing it to the Canadian version (on the right), we seen Massimo picking up the statue. 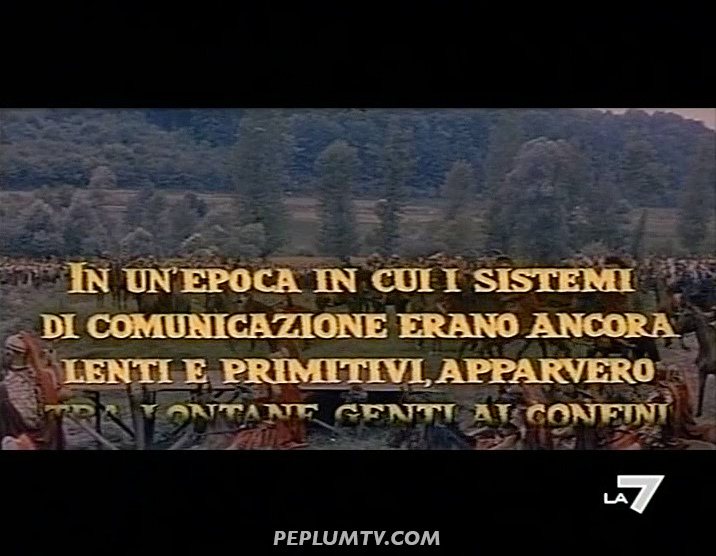 There are a couple of other such abbreviated scenes between the Italian and Canadian versions. The film was originally shot in widescreen and you can see in the side by side comparison how the cropped the film differently between the Italian and Canadian versions. Above and below : At one point in the film, the image is flipped. I don't know which version is the correct one (I'm assuming it's the original Italian one). It's odd but it's not the first time I've seen this happen to PEPLUM films. On the left is the Italian version and on the right is the Canadian version. The 'flipped image' is finally corrected during this scene. That's Piero Lulli as Consul Metello. Above & below : image crop. You can see how the film was entered and cropped between the Italian (left) and Canadian (right) versions. The quality of image between the Italian TV broadcast and Canadian TV broadcast : the color of the Italian version is incorrect. It needs some color correction. The image is also murkier at different spots making it seem like one is viewing the film through a dirty window. The color in the Canadian is better and the image is clearer but by 'cleaning' it up some of the detail seen in the Italian version was washed out. Though the colours are incorrect in the Italian version, the details are much richer. And though the image is softer in the Canadian version, the colours are correct. As I've mentioned above, this is my favourite PEPLUM film starring Peter Lupus. He made 4 films in Italy and though I like his other films, this one is less campy. It needs to be released in widescreen, as intact as possible. I like many of the missing scenes. The film flows much better with those scenes. As a side note, this is one of those PEPLUM films with a confusing title : it's sometimes GLADIATORS or a singular GLADIATOR.